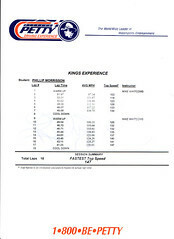 Here is my speed sheet. 150 is the max these cars would go with the setup that they had. The last 4 laps you could smell the rubber burning into turn 3 and 4. It was awesome!